Minimize costs being proactive about roof management. An objective prioritization of capital projects, expense repairs, and maintenance work can be attained. Who Is Responsible For Roof Management? A successful roof management program requires teamwork between the Facility Engineer, Roof Consultant, Property Manager/Building Owner, Roofing Manufacturer, and Approved Applicator (Roofing Contractor). The approach taken to roof management needs to be proactive rather than reactive. It is critical each team member clearly communicates to other team members any roofing needs. Not only is communication important, but education and experience are vital as well for the team members. Technical certifications and continuing education are key to ensuring there is a standard of quality and knowledge when making roofing decisions. The Facility Engineer will have on file, up-to-date information on the roof system that is supportive of the Roof Consultant’s annual inspection and Approved Applicator’s subsequent maintenance responsibilities. The Facility Engineer must be in constant contact with maintenance personnel or other building occupants to ensure that he/she is notified of any leaks or noticeable damage suffered by any severe storms (i.e. hail, tornado, etc.). After discovering any problems, the Facility Engineer should contact the Roof Consultant. Immediate financial support of maintenance requests is imperative to the success of a proactive roof management program. Equally important, the Facility Engineer will have on file a roof history of maintenance actions. Documentation of roof maintenance supports efforts to track repair costs, performance of roof systems and validate warranty claims against the manufacturer or applicator. Finally the Facility Engineer must invoke and enforce access restrictions to the roof areas and keep logs of all personnel and activities performed on the roof. The Facility Engineer should acquire continuing educational credits to ensure that he/she stays abreast of roofing issues. The Roof Surveyor must provide information as to which distresses should be covered under the manufacturer’s and contractor’s warranty (if one exists) and then promptly notify the Manufacturer and/or Approved Applicator of the warranted conditions for corrective action. Proactively inspecting a roof will identify conditions and allow the Facility Engineer to take corrective measures before the condition results in a system failure. Equally, frequent inspections lead to the likelihood of identifying a minor system failure before it becomes a major, more costly failure. The information supplied by the Roof Surveyor empowers the Property Manager, through notification of the appropriate Roofing Manufacturer, to make temporary emergency repairs when necessary. The Roofing Surveyor must be active in ongoing roofing education and experience through independent roofing institutions, as well as, to attend manufacturer’s seminars to ensure that he/she stays knowledgeable in all types of roofing systems. Roofing Specifier will take into consideration why a previous system was successful or why it failed. The Roof Specifier handles Construction Administration tasks. Via Bidding Administration the Specifier: prepares repair and replacement specifications; coordinates and processes bidding documents; conducts Pre-Bid Meetings; analyses bid quotes, etc. Through Contract Administration the Specifier: Coordinates and processes contract documents (change orders, applications for payment, warranties,); conducts Progress and Close-Out Meetings; etc. With Quality Assurance services, the Specifier: provides a Quality Assurance Observer, prepares final Quality Assurance Reports that are submitted to the Facility Engineer and Roofing Manufacturer, etc. The Roofing Specifier must be a Registered Roof Consultant and Certified Specification Writer (certified through the Roof Consultants Institute and Construction Specifications Institute, respectively). The Roofing Administrator must have a minimum certification level as a Certified Document Technician (certified through the Construction Specifications Institute). Quality Assurance is of the utmost importance for a roof project. Quality Assurance Observation documents the installation of the roofing system and materials used to assure that the roofing system is installed exactly as specified. A roof that is installed correctly has a better chance to perform throughout its service life and be easier to maintain by the roof management team. The Quality Assurance Observer must be a minimum Registered Roof Observer certified through the Roof Consultants Institute (RCI). The Roofing Manufacturer reviews the project manual prepared by the Roof Specifier and communicates with the Approved Applicator on the project requirements. These two steps are necessary to promote proper details and system requirements are met in order to issue the specified warranty. After the roof is installed and being notified of any warranty issues, the Roofing Manufacturer must act promptly to inspect warranty distresses and/or issue a purchase order to an Approved Applicator to perform all warranty repairs. The Roofing Manufacturer’s materials must have the proper Underwriter’s Laboratories and Factory Mutual roof system testing and approvals to ensure that the appropriate testing procedures have been performed and results published. An Approved Applicator, also referred to as the Roofing Contractor, performs all warranty and non-warranty (routine maintenance) repairs to the roof system. The Approved Applicator is to be certified (by the Roofing Manufacturer of the roof in question) to perform repairs and has the responsibility of being educated in the Roofing Manufacturer’s roof procedures, limitations, and requirements. If a contractor warranty exists, then the Contractor that holds the warranty is the preferred entity to perform repairs. The Approved Applicator should be the only contractor to perform warranty and non-warranty repairs to the same roof. This eliminates questions of who to go to if there is an ineffective or improper repair. During roof replacement projects, the Approved Applicator must provide a competent foreman, safety officer, environmental officer, and Quality Control Inspector. The Approved Applicator must show evidence of continuous Approved Applicator status with the Roofing Manufacturer for a minimum period of five years prior to any repair or replacement project. Also, it is important that a list of projects of similar scope and complexity be submitted prior to all roof projects. In 1984, the U. S. Army Corps of Engineers began developing an Engineered Management System for Low and Steep Slope Roofing Systems, called ROOFER. This system was originally designed to be used by the military as a systematic method to determine repair or replacement priorities and to maximize cost effectiveness. However, this program has reached the public domain and it has far reaching benefits for public and private building owners as a Roof Asset Management Program. ROOFER’s primary functions are to inventory roofing systems on the building, to ascertain their visual conditions and to predict deterioration rates. This requires an objective, repeatable system for determining the present roof condition. ROOFER uses the Roof Condition Index (RCI), a numerical index from 1 (failed) to 100 (excellent) that gives an indication of the waterproof integrity and repair requirements. The RCI is based on three separate component Condition Indexes (each index is a measure of its ability to perform): Flashing (FCI), Membrane (MCI), and Insulation (ICI). For the FCI and MCI, Mac Brady’s surveyors document the roof’s present condition by noting observable distresses for each type of roof. The condition of the roofs are functions of each distress type, distress severity, and distress quantity. Deduct values are used as weighted factors to indicate the degree a component is affected by each particular distress type and severity level combination. For the ICI, Mac Brady’s surveyors conduct non-destructive moisture testing of the insulation components to determine if excessive moisture is present. Low, medium, and high severity levels are defined for each distress. A low severity means that a problem exists but no repair is required. A medium severity problem indicates a need for repair but the waterproof integrity of the component has not been compromised. A high severity distress has a great potential for allowing water into the system and, therefore, should receive a repair as soon as possible. In the example below, a roof was surveyed at year 15 with a calculated RCI of 75. However, the RCI could be increased to 87 if repairs were made to the medium and high severity distresses. This would result in an increase of 3 years of Additional Service Life (ASL) for this roof. Any good Roof Asset Management Program needs to answer the key question “Is it more cost effective to repair this roof than to replace it?” Recommended repairs/replacement methods with budgeted costs are calculated for each roof. 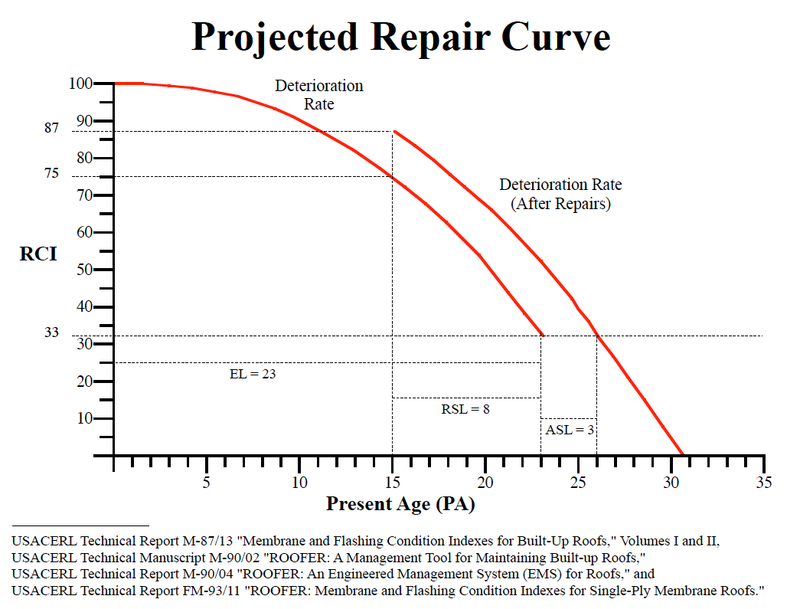 Ratios between repair and replacement costs are analyzed to provide which method is more cost effective. However, ROOFER gives the building owner the tools he needs to make those priority judgments when budget funds are not available for roofs with ratios indicating replacement. Roof Asset Management of a network of roofs requires a systematic, analytical, and objective method of determining repair versus replacement needs and priorities to ensure efficient allocation of resources. The ROOFER Program provides this systematic, analytical, and objective method needed to meet this criteria. Mac Brady has been using the ROOFER methodology to objectively inspect and analyze roof systems since 1989. For more information on how Mac Brady and the ROOFER methodology can save you money on your roofs, please do not hesitate to call 708-354-1343 or email Melissa Lieb at mlieb@macbrady.com.